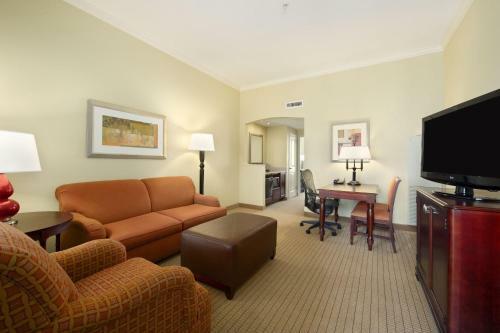 The 360 all-suites Embassy Suites Tampa Convention Center is connected to the Convention Center via a sky-bridge and provides top quality accommodation for both the business traveler and the vacationer. 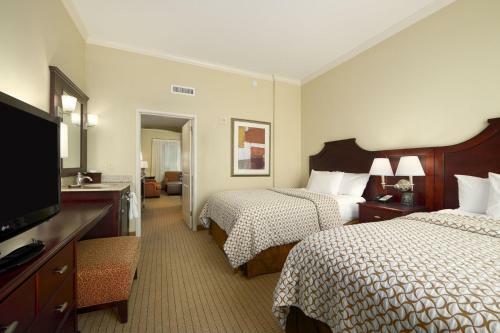 Items included with the room rate at this full-service downtown hotel are a cooked-to-order breakfast, a managers evening reception with hot and cold snacks and beverages, in-room coffee and a copy of USA Today. There are 12 meeting rooms available for business or social functions. The largest can accommodate 375 guests. The property is next door to the St. Pete Times Forum which stages sporting events, concerts and exhibits. Other area landmarks and attractions include the Gulf of Mexico beaches, several championship golf courses, the cruise ship terminal at the Port of Tampa, Busch Gardens, the Florida Aquarium, Lowry Park Zoo and the Museum of Science and Industry. The two-room suites come with a choice of one king size bed or two double beds. There is a sitting area with a sleeper sofa, two televisions with cable news and movie channels, pay-per-view movies, work desk with high-speed Internet access, in-room safe, alarm clock-radio, kitchenette with refrigerator, microwave oven and coffeemaker, two dual-line telephones with voicemail and speakerphone, iron and ironing board, curved shower rod and a hairdryer. 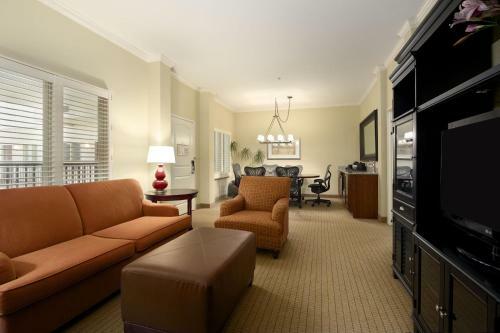 Non-smoking suites and handicap accessible suites are available. This hotel has an outdoor rooftop swimming pool, sundeck and a fitness center. There is a coin-operated laundry, ATM, gift shop and convenience store, tour desk, business center, baggage hold and a valet dry cleaning service. The 24-hour front desk has safe deposit boxes. The on-site Trolleys American Café is open for lunch and dinner and room service is available from 11am until 11pm. There is also a Starbucks Coffee on-site that is open from 5am until 8pm. Restaurants nearby include Tina Tapas, Bern's Steakhouse, the Columbia Restaurant, Café Dufrain, a Bennigans and the Valencia Garden Restaurant. This is a beautiful hotel with an impressive lobby and many visitors to Tampa had no problem recommending the property to fellow travelers. 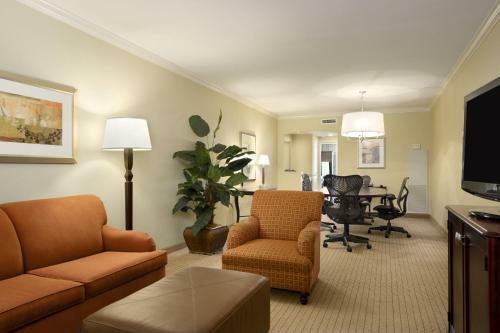 The location was convenient - an easy walk to the convention center - and the rooms on the high floors of this Embassy Suites had stunning views of Tampa Bay. The made-to-order breakfasts were enjoyable as were the evening socials with a light meal and wine. The suites were fully equipped and comfortable and the staff was praised for professional and efficient service. Parking: Yes, there is parking. Valet parking only and it costs $20 per day plus tax.